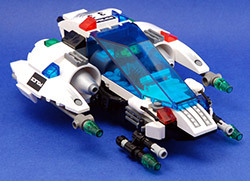 LEGO maybe retiring the Space Police line for the time being, in favor of the upcoming Alien Conquest, but that’s not stopping people from putting out their own creations. While some like to go for the complex and outlandish, others go for a more simple/streamlined view, which I prefer. Eurobricks forum member DrNightmare has created a really cool little Space Police MOC which fits into the types of Space Police sets and MOCs that I like. As of yet, it doesn’t have a formal name (he’s looking for suggestions). He’s waiting on a few parts to complete it and/or clean it up. He’s including a lot of pictures as well as a photo of the original prototype. As small as it is, he’s managed to include a droid.